Baobabs (Adansonia spp.) 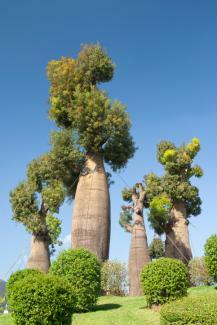 are unusual-looking trees found primarily in the arid regions of Africa and India. They are intolerant of cold weather, but can be grown in a pot and brought indoors for winter. Baobab trees are known for their immense bottle-shaped trunks which are used to store water in the dry environments where they grow. The bark is smooth and the branches and leaves are concentrated near the top of the canopy. The leaves are about the size of a human hand and are divided into five oval-shaped leaflets about 3 or 4 inches long. White flowers, about 4 inches in diameter with a prominent cluster of stamens in the middle, appear in spring. The fruits develop over the summer into foot-long, club-shaped appendages that dangle from the tree. In their native habitats, the trees can grow up to 100 feet in height. Baobabs are an important ethnobotanical species in the regions where they grow. The tender young leaves are eaten as a vegetable and the fruit is made into a beverage. Fiber is traditionally woven from the bark and the trunks have been made into a variety of objects, including canoes. Baobab is hardy in USDA zones 10 to 12 and needs excellent drainage. Both frost and wet soil can easily kill the trees. A few areas of southern Florida and southern California are suitable for growing baobab in the ground, but most North American gardeners will be growing it in a pot. Because of its drainage requirements, it is best to grow baobab in a 'cactus mix' type of potting soil, which is widely available in garden centers. Though the tree can reach enormous proportions, they are surprisingly adaptable to container culture and have even been used as bonsai specimens. The bigger the pot is, the larger the tree will grow and the longer it is likely to live. Plant baobabs after all danger of frost has passed in spring and always allow the soil to dry out completely between waterings. In fall, stop watering altogether. This mimics the onset of the dry season in the baobab's native habitat and will cause the plants to drop all of their leaves and go completely dormant. At this time, the potted plant can be brought indoors and stored until spring. Store it in a frost-free location away from direct sunlight and do not give it any water during this dormant period. No other special maintenance or pruning is required. The trees are very susceptible to root rot if they are over-watered, but otherwise do not suffer from pests and disease when grown outside their native habitat. 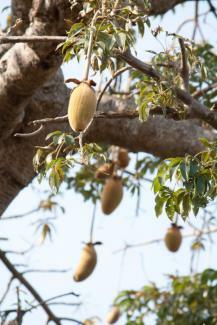 There are a number of different baobab species. None of them are commonly available in retail nurseries, but it is possible to order seedlings online. Adansonia digitata is from sub-Saharan Africa where is grows up to 80 feet in height with a bulbous trunk up to 40 feet in diameter. Adansonia grandidieri grows wild on the island of Madagascar to 80 feet in height with a cylindrical trunk up to 10 feet in diameter. 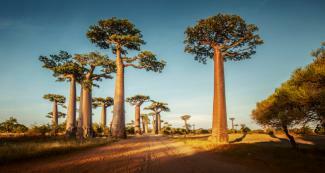 Adansonia rubrostipa is a smaller baobab that usually grows to just 15 feet in height. Baobob trees live for hundreds of years and have provided sustenance of every sort to the indigenous people where they grow. Growing one at home in a pot is a fun experiment and makes a great conversation piece.